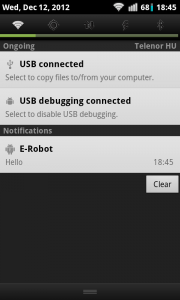 E-Robot is an automation application which makes it possible for your device to execute commands automatically – all you need to do is define these commands. 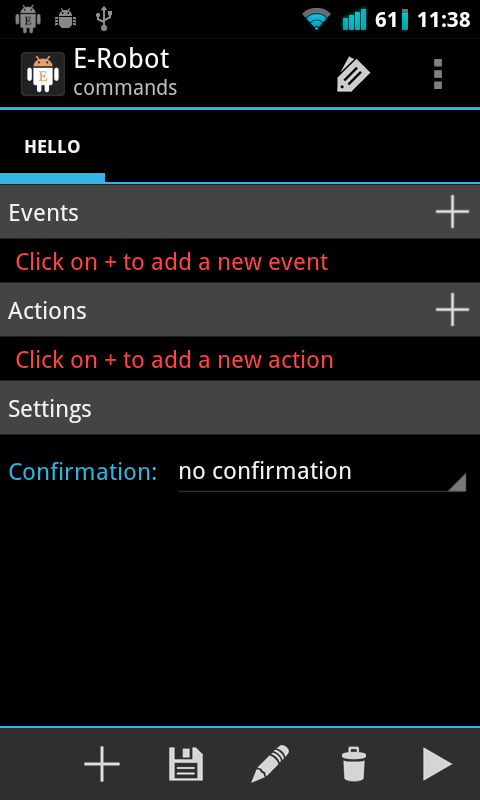 When you create a command you can specify which actions to execute when a given event occurs. 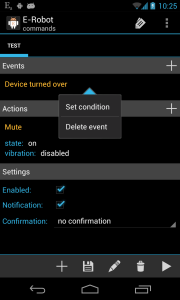 Furthermore you can set conditions for both events and actions. 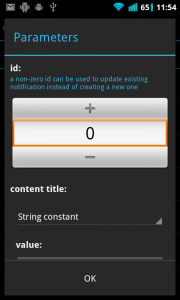 The application allows you to specify more than 130 event types and execute more than 50 action types; furthermore, all event and action types can be parameterized, making the app even more versatile, and its functionality may be expanded in the future. 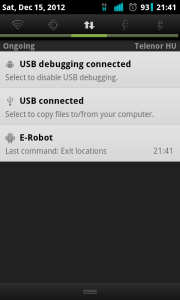 E-Robot can handle events which are location-based, time-triggered, application-handled, and more. 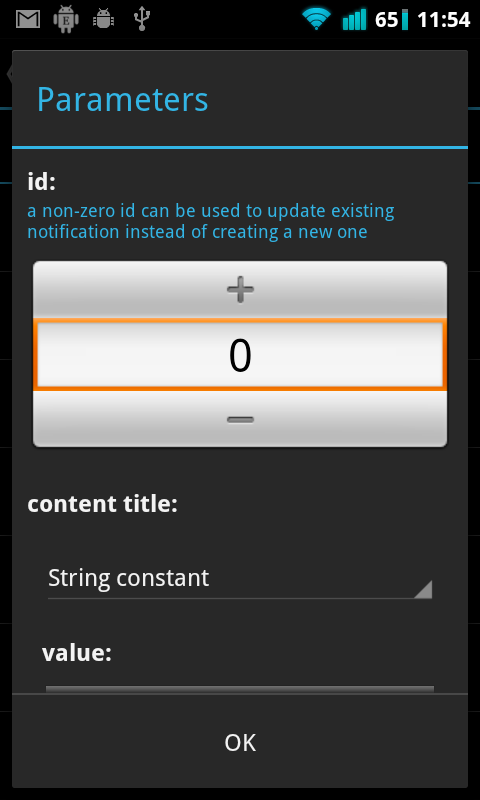 It can of course execute Elixir 2 profiles as well, so you can automate profile activation easily. 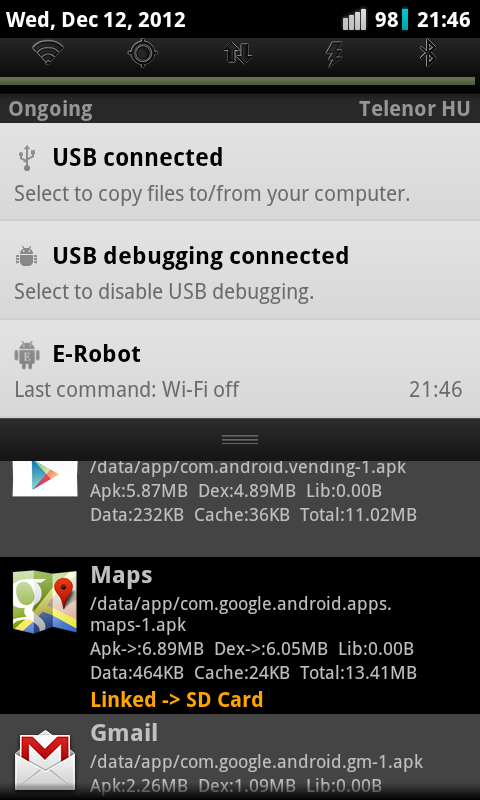 Commands can also be executed manually from the application itself or using shortcuts, and not just automatically as a result of specific events occuring. 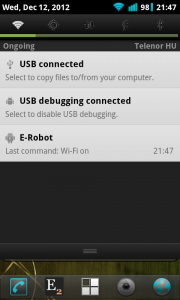 Continuing with the top line there is the “tags” icon, which allows you to organize your commands into GROUPS, and the final icon next to it is a menu which makes it possible to access other features of the application, including E-Robot’s settings. 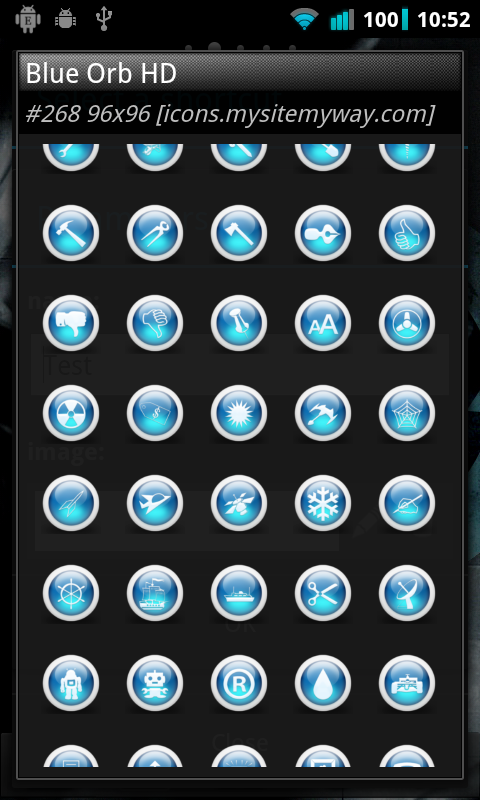 The next row down contains tabs, one per created command, each bearing the command’s given name. 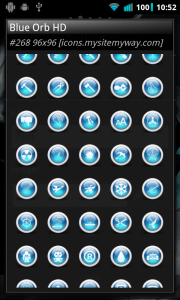 You can jump from one command to the next using these; in the screen capture above there is only one command created (“HELLO”) and so it is the only tab in evidence. 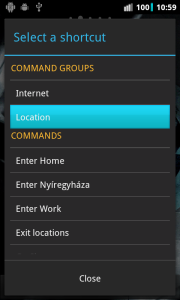 The space which begins below this tab row and which extends almost to the bottom (the “middle” of the screen) is reserved for the definition of the selected command. 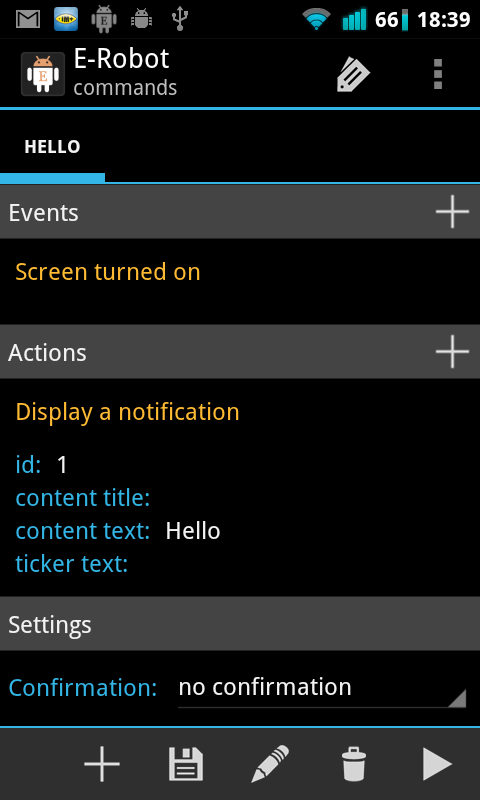 Application-based events allow you to execute actions based on application-type events, such as an app launching (i.e. 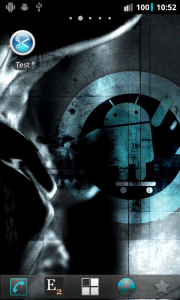 if such-and-such app launches, then do this), stopping, receiving focus, or losing focus. Oftentimes the same commands will be useful for more than one application, so it is useful to organize applications into groups and refer to these app groups as a unit when they are to be part of a command definition. 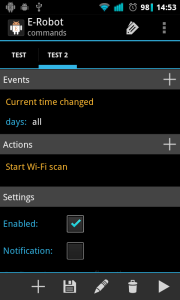 For example, let’s assume we want to turn Wi-Fi off when using certain applications, because we don’t want them to use internet, but we do want Wi-Fi to be on when certain other apps that really need it are in use. This will be the focus of our next example. 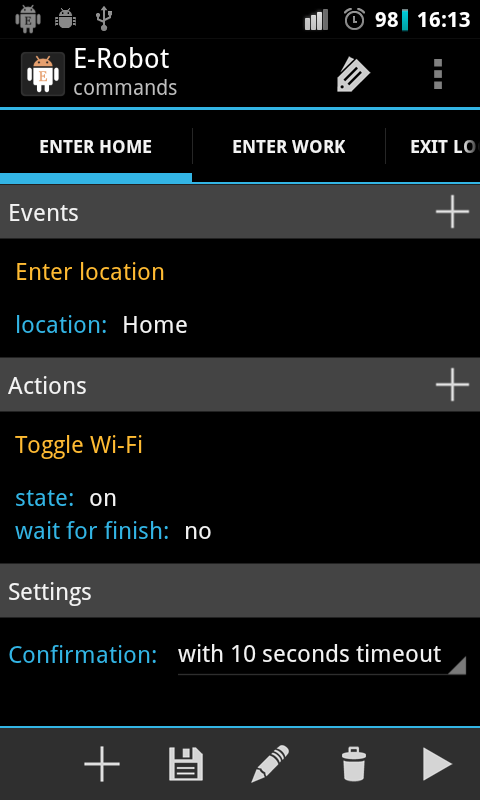 We have sorted our apps by creating the “no wifi” group; now we need to leave the Applications screen and go back to the Commands screen to create the commands which will turn Wi-Fi ON and OFF. How E-Robot will determine whether Wi-Fi should be ON or OFF will depend on which application is currently receiving focus. 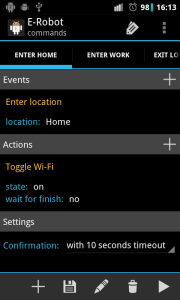 For example, if we are playing Hearts® the focus is on that game, and since Hearts® is in the “no wifi” group, we will define our Wi-Fi OFF command to say that if the “no wifi” group is currently receiving focus (we do this by defining the group itself as a parameter inside the command), turn Wi-Fi OFF. 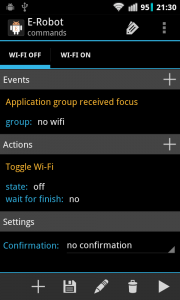 Conversely, if we are using Maps® the focus would be there instead, and since Maps® is not in the “no wifi” group, we need to define our Wi-Fi ON command to say that if the “no wifi” group is not currently receiving focus (again, by defining it as a parameter inside the command), turn Wi-Fi ON. 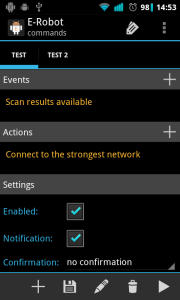 Now create action “Wi-Fi ON”; the steps are identical to above with one exception: the event this action is concerned with is Application group lost focus (i.e. 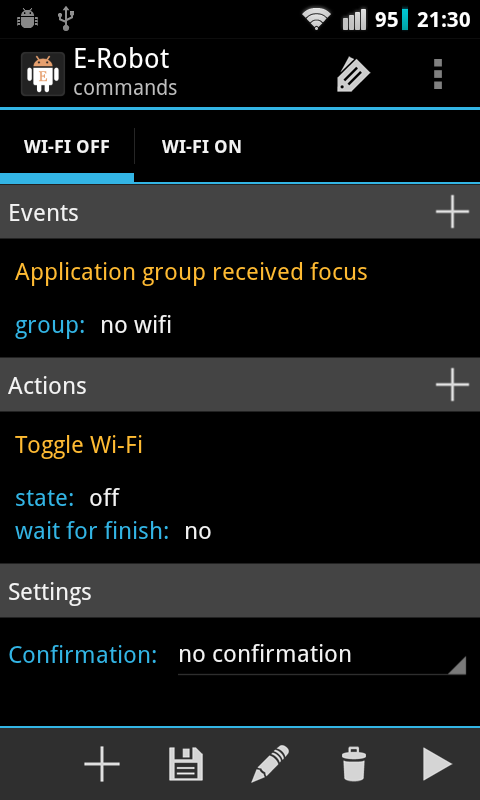 lost focus instead of received focus, as for Wi-Fi OFF). 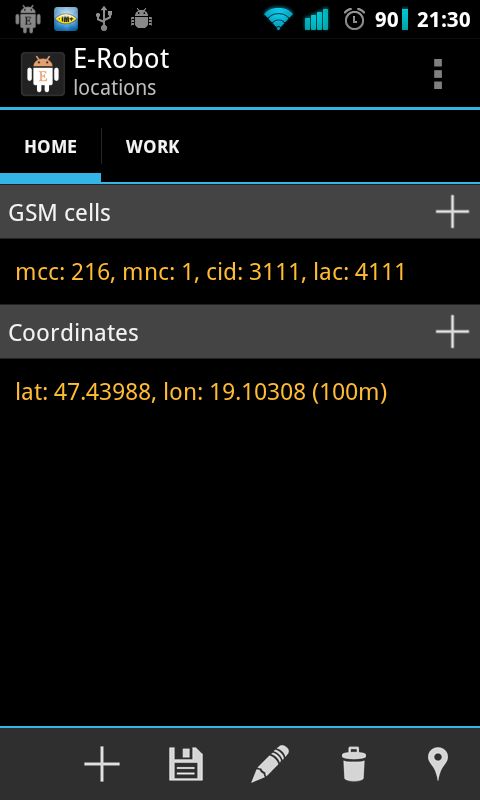 Locations can be defined using cells (GSM or CDMA) or map coordinates. Many people are acquainted with the idea of latitude and longitude-based map coordinates, but perhaps not as many with cells. By “cell” we just mean the area around a cell phone tower base station. Your city has a great many such towers because their effective range is limited, so just think of your city as having been “chopped up” by your carrier into cells with a communication tower in each cell. 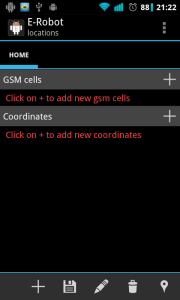 So using cells to set location just means using the cellular towers closest to you to pinpoint your location. 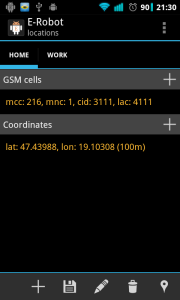 Cell-based positioning is less accurate than positioning via map coordinates but requires quite a bit less power. 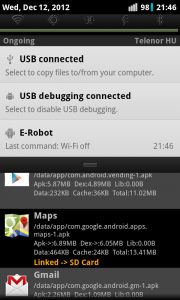 Coordinate-based positioning is more accurate but needs either GPS or at least mobile networks to be on. It is suggested you let E-Robot scan for at least 5 minutes to collect data on as many adjacent cells as possible, as it will sometimes take that long to obtain more than a single result. 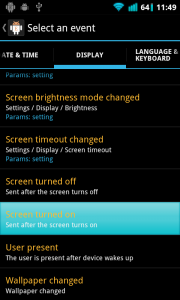 If doing this for home, as in the example, you may get a better result if you walk around your house. 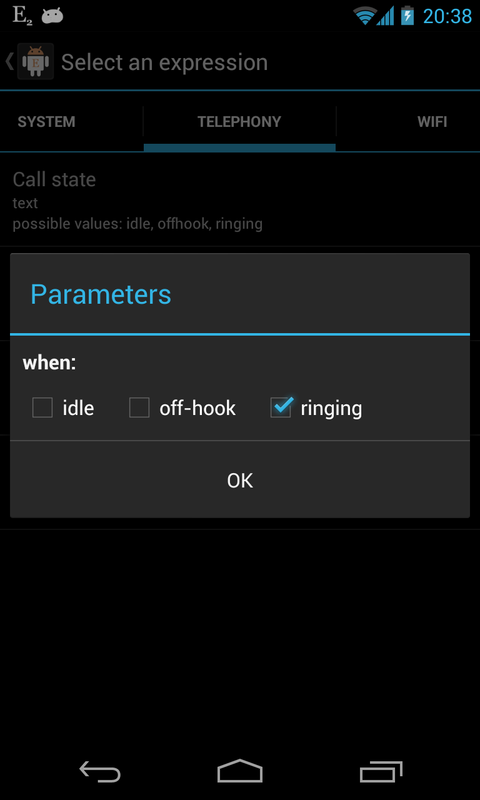 And as a final point on the matter, you may find that opportunities arise that let you add new cell info to a location (this will be made clear further along in this section). 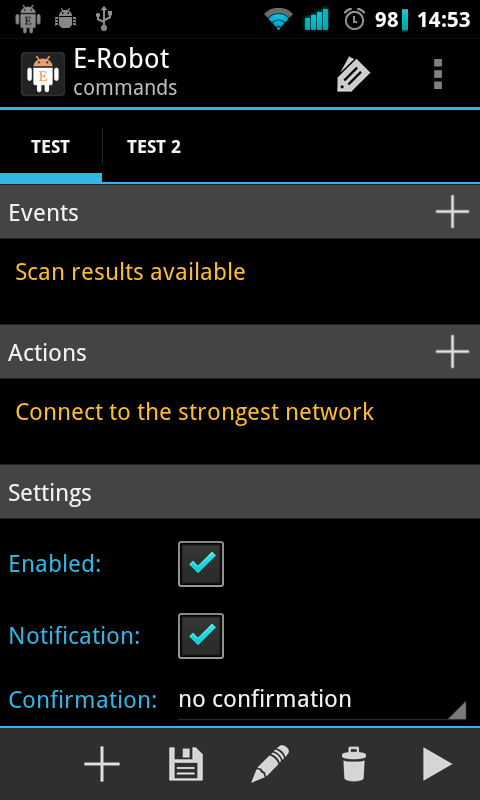 Whenever you are ready to have E-Robot save the scanned info to the selected location, click on the [Add cells] button. 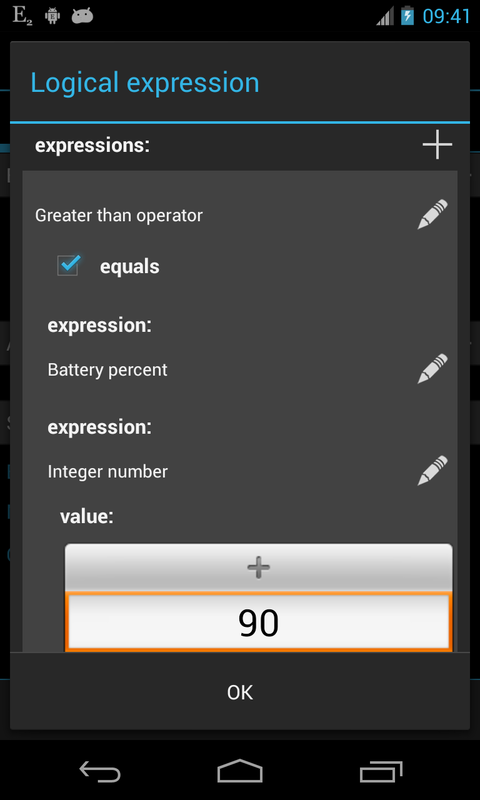 To use coordinate-based positioning for the same location, simply click the “+” sign at the far right of the “Coordinates” row and tap the “pencil” icon that will appear. 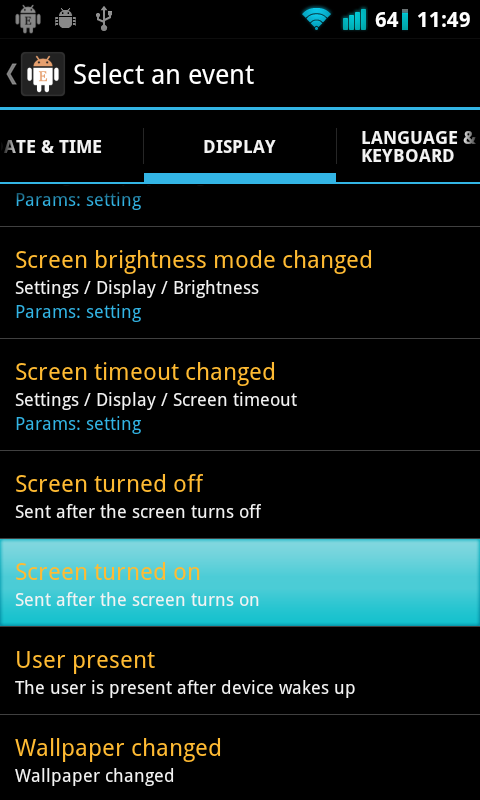 The screen will change to the familiar “Maps” look with your location appearing using a red marker. 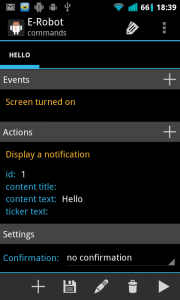 Move the marker to your current location, which may or may not be directly over a blue dot (the blue dot is your device’s idea of your current location using mobile networks alone or mobile networks with GPS enabled) and click [OK], then click [OK] again. 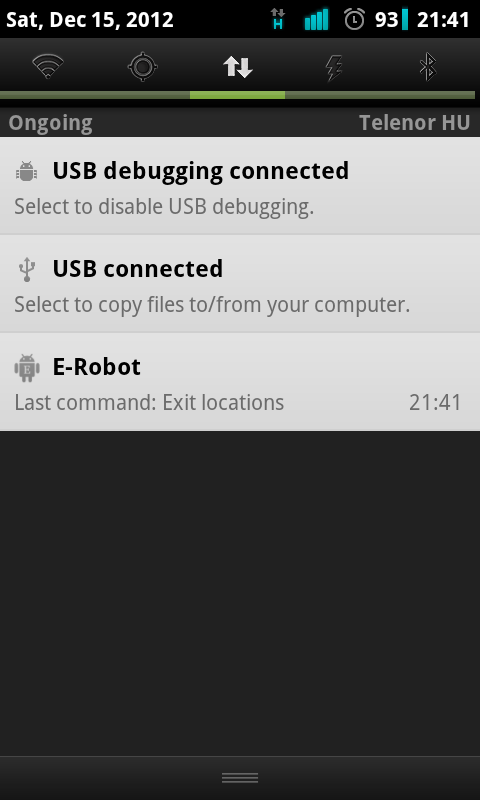 Using the History screen would allow you to determine why in this case E-Robot thought you were no longer in any of your defined locations. 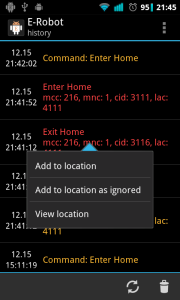 For example you would be able to see the cell info that was not defined as part of your location and which consequently triggered the corresponding exit action(s). 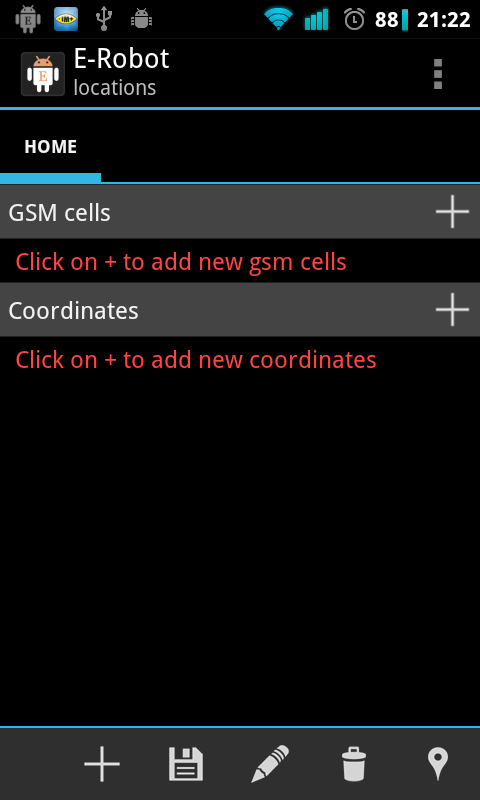 If you know you really were at the location in question, you could click on the row in the History with the new cell data and add it to the location, but you may also choose to define the cell as an “ignored cell (by clicking “Add to location as ignored” in the screen capture above). 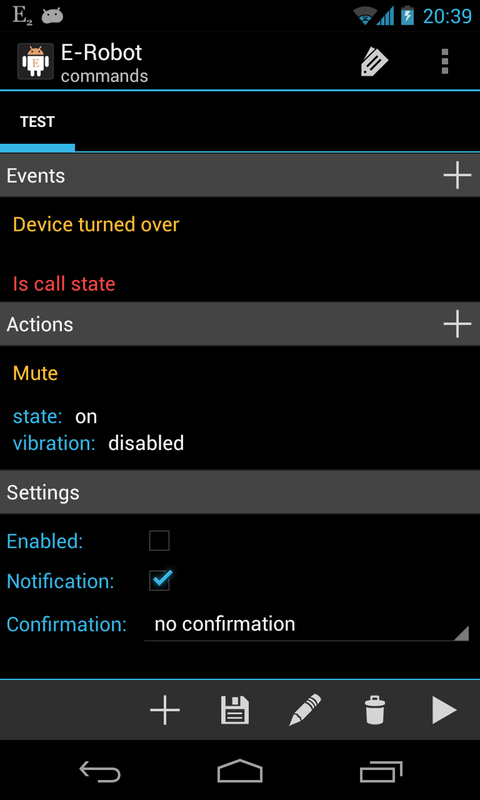 You would do this if it was a “fluke”, meaning in this case that your device communicated with a remote cell, as occasionally happens. Adding the fluke cell to the location as an ignored cell offers the advantage that, if it were to ever happen again, E-Robot would not react as if you left your location (unlike the first time), but neither would E-Robot react as if you entered your location were it to encounter this cell (and thus erroneously trigger “Enter location” commands). 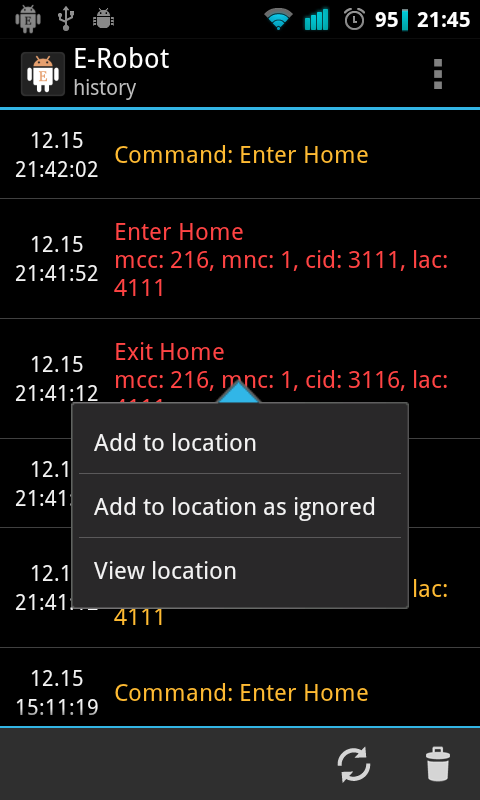 It is in this important way that “Add to location as ignored” differs from the more basic “Add to location”. 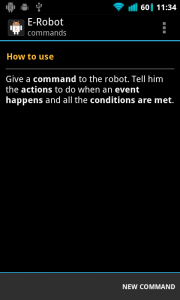 Conditions can be set for both events or actions. 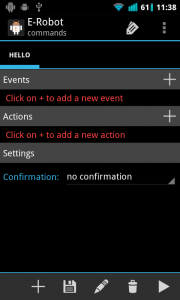 If you set a condition for an event and this event triggers then the command will be executed only when the condition is satisfied. 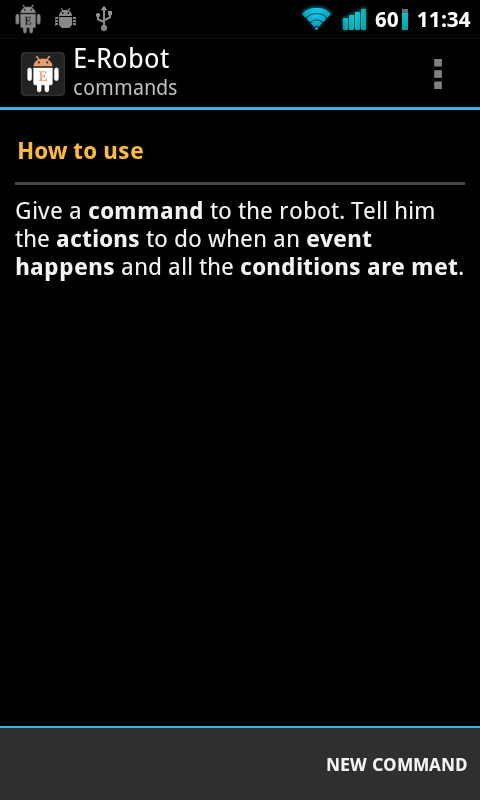 If you set a condition for an action then the command itself will be executed but only the actions without a condition or with satisfied condition will be executed. 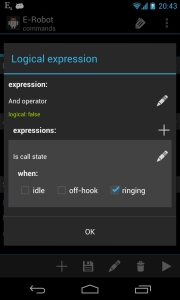 A new windows appears where we have to set a logical expression as a condition, as we can see it from the title. 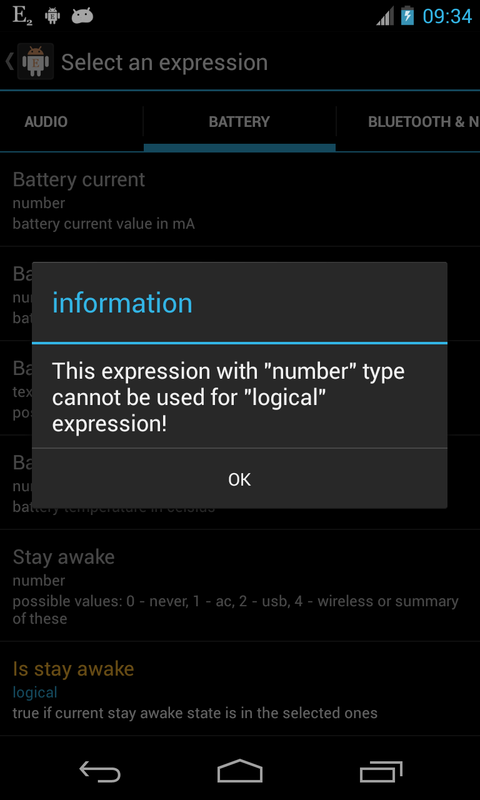 If the value of this logical expression is true than the condition is satisfied. 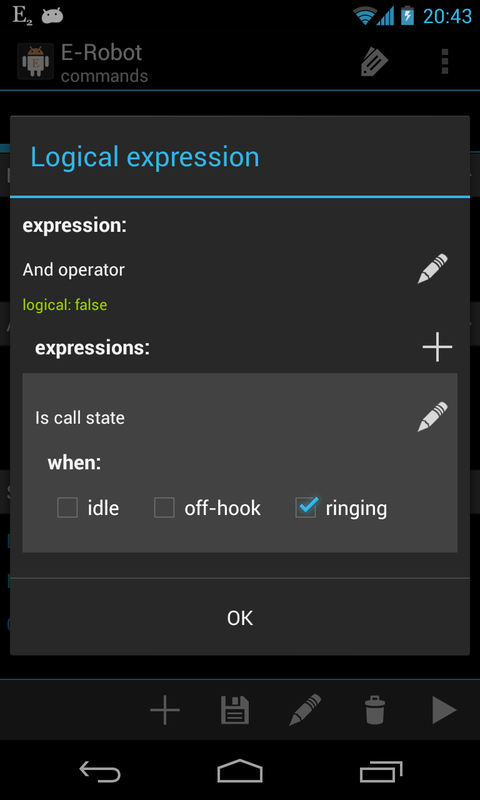 If you set a condition then the default expression is the And operator to be able to set complex conditions easier, for example: screen is on AND wifi is on. 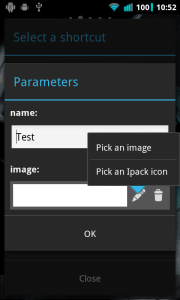 You can change or set an expression if you click on the icon next to it and select the Change expression option. 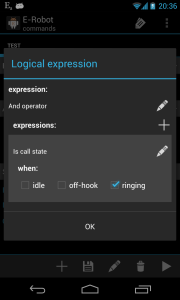 So you can change the And operator this way too if you want to use something else. 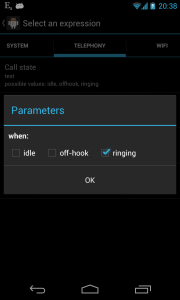 Now click on the icon next to No expression to set the condition “when the phone is ringing”. 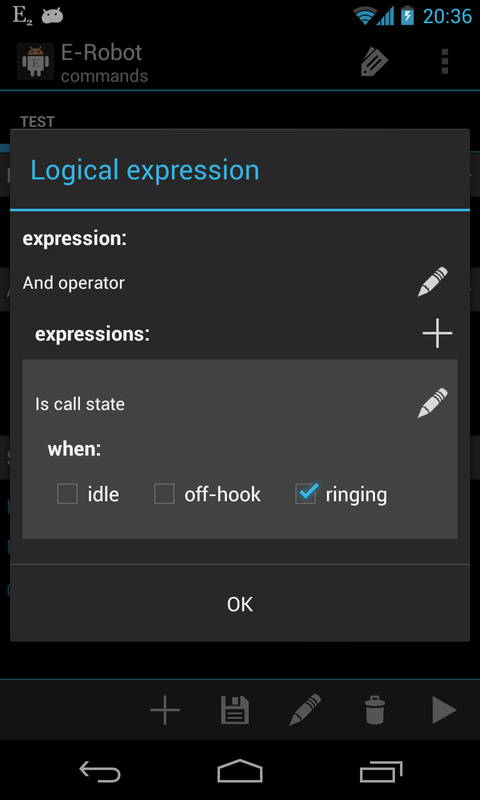 An expression selector screen appears where you should go to the tab Telephony and select the Is call state expression. 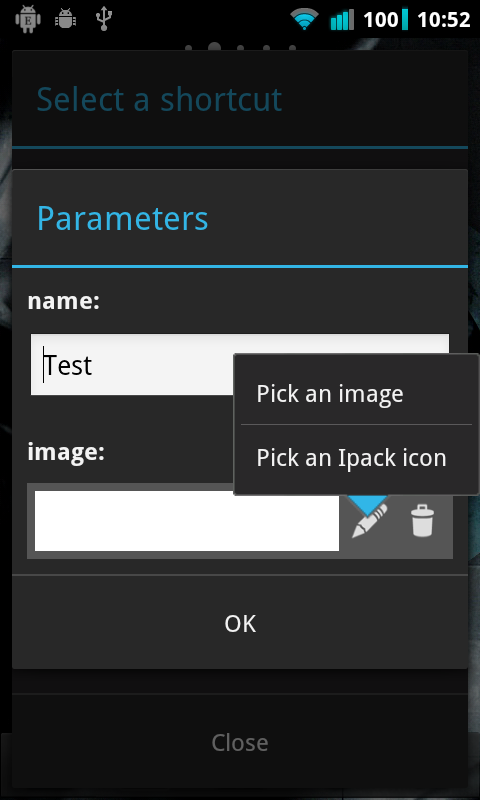 Now you can see the whole expression and finish the configuration by click on the OK button. New condition can be added easily if you click on the + button of the And operator. 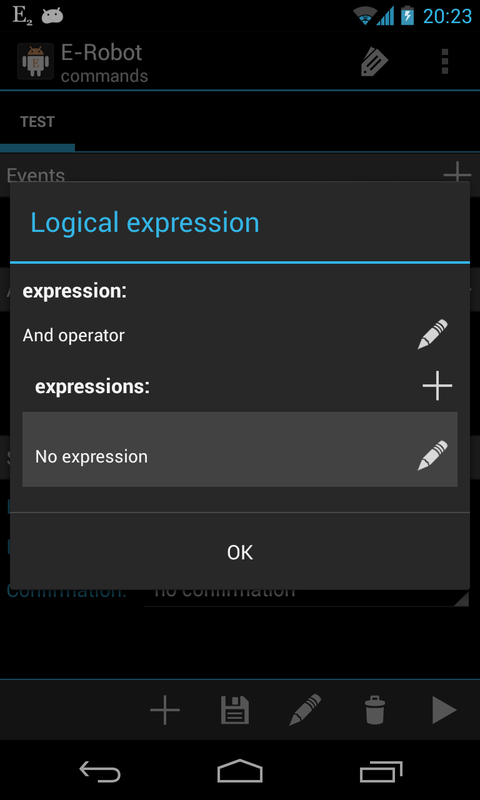 The created expressions can be deleted by clicking on the icon next to the expression and selecting the Delete expression option. As expected, all of the command examples in this documentation perform their action(s) based on their respective command’s associated event(s), as defined by the user, but they also have one other thing in common: the actions are all performed automatically once the conditions are met. Is this not to be expected? 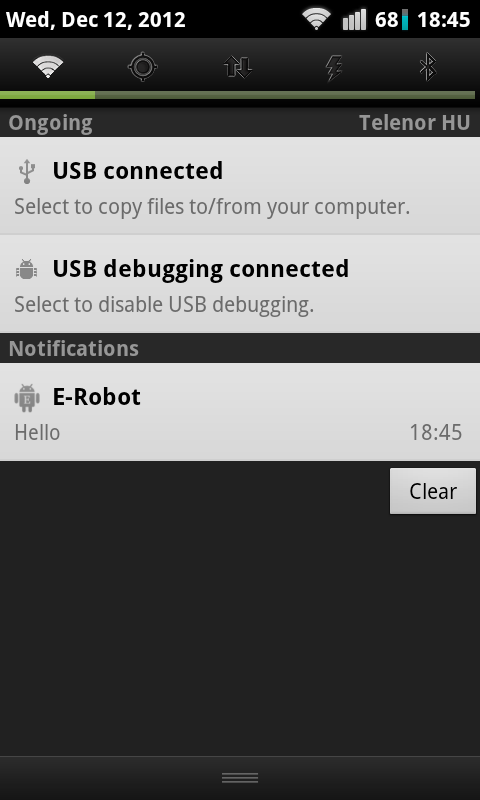 It certainly is, as it is the basic idea behind E-Robot. 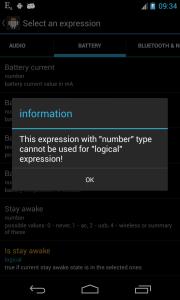 But we need to introduce here an idea we have not yet considered: the fact that automatic command execution can, in certain instances, actually be annoying. 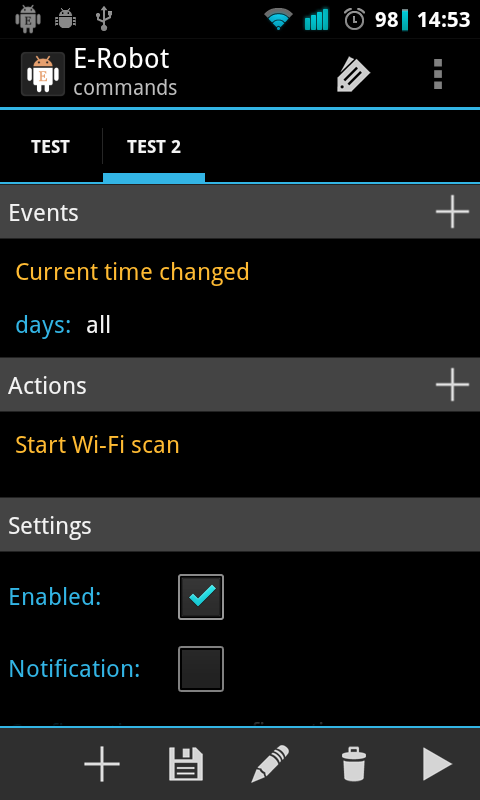 Let’s imagine we created a command that automatically turns Wi-Fi off at 10:00 PM (22:00) every night, because we tend to retire for the night shortly thereafter (we have seen such an example earlier in this documentation). But what if, once in a while, you wish to continue using your device – AND therefore Wi-Fi – for a while longer, say an extra hour or so. 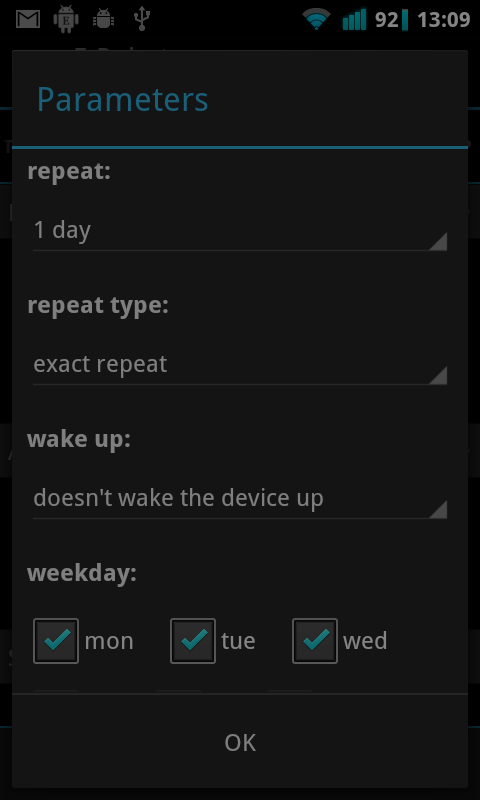 It would obviously be irritating if your device automatically toggled Wi-Fi off at 10:00 PM on those nights. 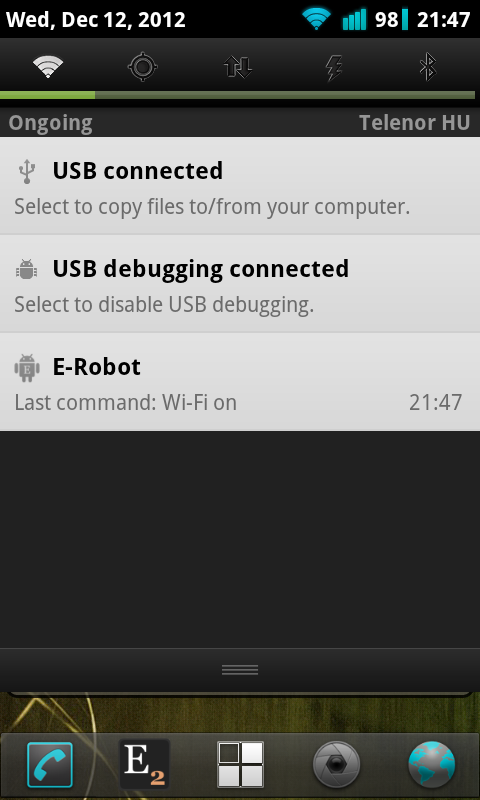 If this were to happen you could just manually turn Wi-Fi back on of course, but this would defeat the purpose of E-Robot somewhat. 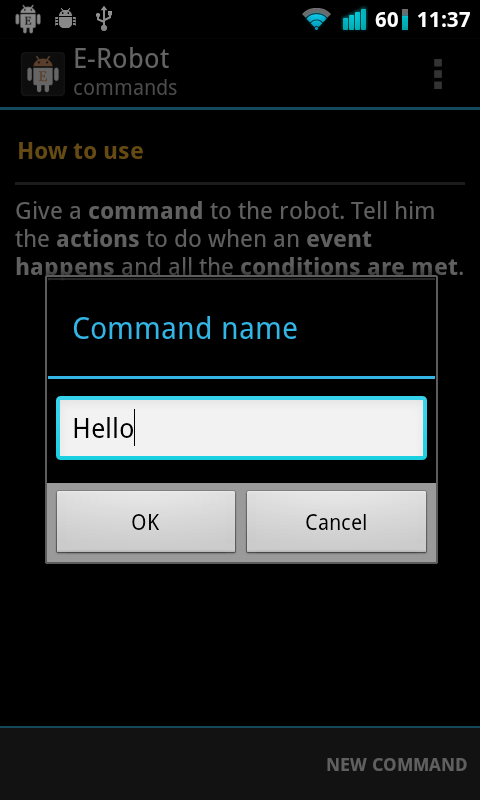 E-Robot has foreseen such eventualities and offers a more elegant solution by allowing one to specify that a time-delimited confirmation be associated with the execution of a command, allowing the user to postpone (or outright block) execution of said command. As can be seen in the screen capture above, command confirmation is enabled simply by clicking the “Confirmation” field that appears toward the bottom of the screen when defining commands. 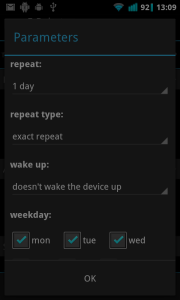 A choice of time spans (eg. 10 sec, 30 sec, etc.) 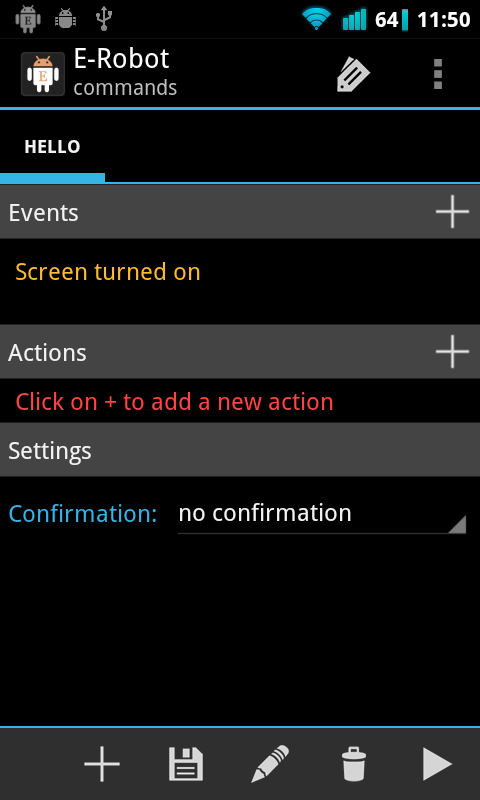 will appear, or you can choose “no confirmation” if you’ve thought better of it. 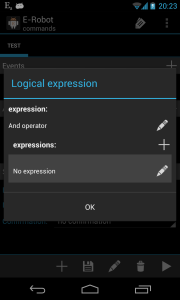 Confirmation of command execution may be specified whenever the field appears under “Settings” on the Commands screen where commands are defined. 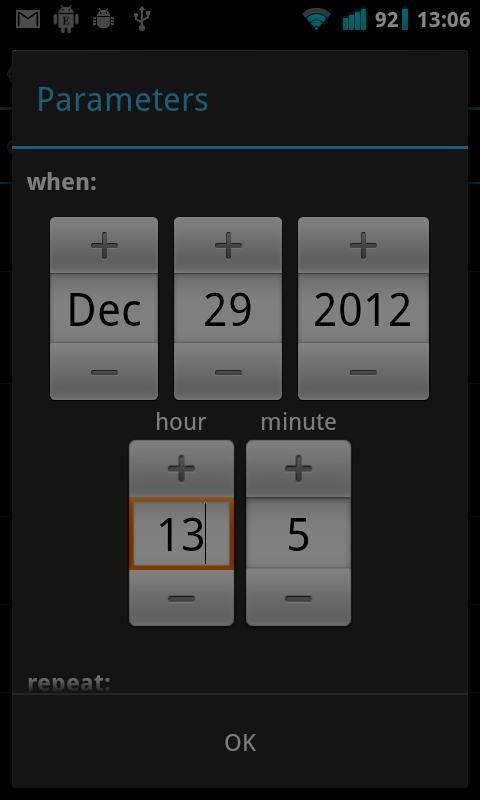 If you choose to postpone execute (“Later”), another popup will appear with a selection of time spans (eg. 5 min, 15 min, etc.) 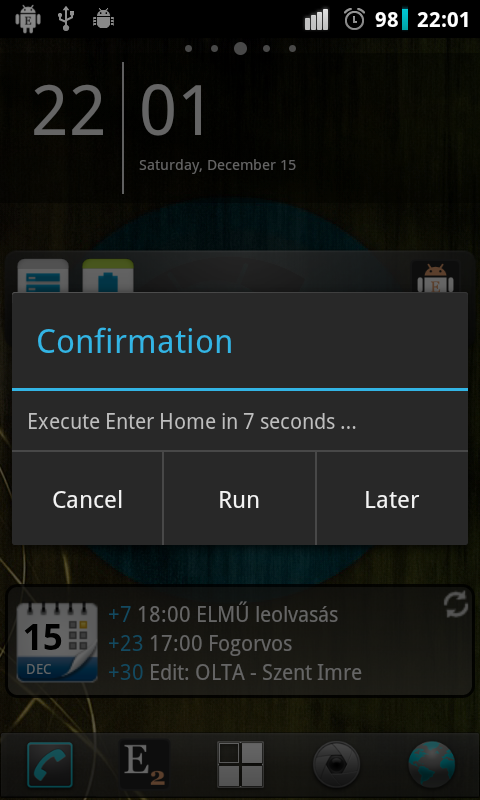 For example, if you know you only need to continue using the device for another couple of minutes because you are just about finished what you are doing, you could choose “5 minutes later” from the menu; E-Robot would then automatically request command execution confirmation again five minutes later.